House 6805 in the town of Podgora, Makarska - Central Dalmatia contains accommodation units of type Apartment (2) and is 100 m away from the sea. The nearest beach to this accommodation is a pebble beach. The house is categorized as "Facilities near a beach". As the house is divided into several accommodation units, other guests will most likely be present during your stay. The hosts will be in residence during your holiday. The house owner is under no obligation to accept additional persons and pets that were not stated in the reservation request and it is necessary to report them in advance. Apartment can accommodate 2 guests. Beds are situated in 1 sleeping rooms, within 30m2. Guests can enjoy a sea view from the private terrace. Food can be prepared using barbecue which is shared with other guests too. INCLUDED IN THE PRICE: tourist tax, final cleaning, parking, internet, ironing board, hairdryer, portable barbecue. OPTIONAL ADDITIONAL COSTS: air-conditioning (€5.00 per night), laundry (€3.00 washing). super kwatera z pelnym wyposażeniem i w idealnym stanie. Dwa tarasy wiec zawsze ktorys jest w cieniu. Zejscie schodami i jestes wprost na plazy,, widok na morze, a wieczorem chłodny wietrzyk od morza. Własciciele są na miejscu i z niczym nie ma problemu, my byliśmy np. z psem. generalnie super i polecam wszystkim. Wir waren im Juli 2018 in der Unterkunft. Es war alles sauber, ordentlich und hat an nichts gefehlt. Die Vermieter wohnen mit auf dem Grundstück und sind sehr nett und bemüht, den Gästen den Urlaub so schön wie möglich mit zu gestalten. Der Strand liegt praktisch direkt vor der Tür, die 110 Stufen sollten jedoch nicht unterschätzt werden. 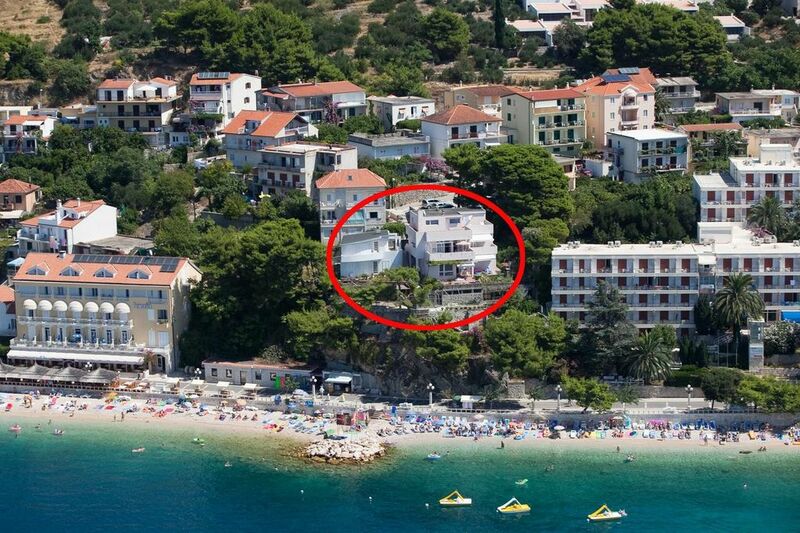 Auch ist es am Strand nicht sooo überlaufen wie im 8 Km entfernten Makarska (Touristenhochburg). Man kann den Vermieter mit seiner Unterkunft ruhigen Gewissens weiter empfehlen. Ein Bäcker für das Frühstück befindet sich nur 200m entfernt. Auch sonst kann man am Strand schön essen gehen oder hat abends ein abwechslungsreiches Unterhaltungsangebot. Wir kommen gerne einmal wieder. Excellent apartment with a fantastic view.Host is very friendly and helpful.Very clean.The bed was very comfortable. The washingmachine didn´t work but the host washed for us. But I really like to have a washingmachine in the apartment so I can rinse beachtowels etc. Towels in the bathroom where very small. And the chairs on the terass could be more comfortable. But we had a really great time in the apartment and would absolutely come back.